As you can imagine, I’m a big fan of utilizing technology to improve our lives. This is especially true in our relationships where it’s so easy fall into patterns where we rely too heavily on our electronics and let it have a negative impact on our roles as spouse and parent. Of course, as an Engaged Marriage reader, you’re taking the initiative to use the power of the Internet for good. And I am excited to share the work of a friend who “gets it” and has found a way to combine her abilities as a therapist with the power of online availability to help many couples – from engagement through marriage refresher. 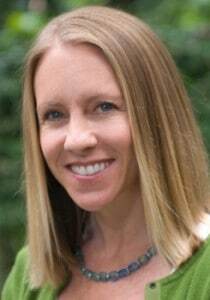 Lisa is a licensed psychotherapist with a private practice in Marin County, California. Through her practice, she’s able to help many couples in the San Francisco area, and while that’s fantastic, it’s also limiting. So, Lisa has found ways to make a positive impact on many more marriages by taking her expertise online. I probably first encountered her on Twitter, and I was immediately impressed by her site and the resources available there. While she is quick to note that these resources are not a replacement for face-to-face therapy for those who need it, Lisa has developed several fantastic resources to help couples right from the comfort and convenience of their own homes. I had the privilege of reviewing a copy of The Marriage Refresher Course Workbook, and I definitely recommend it for couples who are looking for a therapist-led refresher on the big issues that are impacting their relationship. As you can see by the topics listed, The Marriage Refresher Course Workbook is really intended to get back to the basic (and vitally important) foundational issues in your marriage and strengthen your relationship from there. For many couples, this kind of focus will have a dramatic impact on the quality of their marriage and family life. 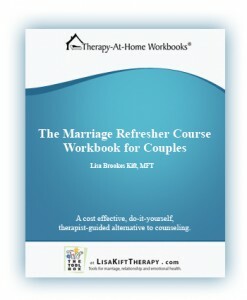 I encourage you to go check out the overview page for The Marriage Refresher Course Workbook for all the details. If you’re not married yet or are newly married, check out what Lisa’s offering with The Premarital Counseling Workbook for Couples. 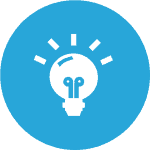 These are great resources available in a super-accessible format. I love that! ARE YOU TIRED OF FIGHTING? Download This One Must-Use Strategy to Avoid Fights! Dustin Riechmann created Engaged Marriage to help other married couples live a life they love (especially) when they feel too busy to make it happen. He has many passions, including sharing ways to enjoy an awesome marriage in 15 minutes a day, but his heart belongs with his wife Bethany and their three young kids. 15 Minute Marriage Makeover for $2.99 plus $30+ in Bonuses! I think my husband could have used more preparation for unreasonable expectations that you develop after being married. It’s easy to expect your spouse to fulfill all of your needs and while that is impossible, it also puts a lot of stress and tension on the shoulders of one person. My wife and I weren’t aware of the extent of time and effort that goes into a marriage. Dating comes so easily because you’re “in love” and trying to show your best side, and when the “in love” stage went away, we weren’t quite prepared. After coasting along for some time, it is taking some serious work to “recharge” and get back on the track we want. We’ve heard that marriage is hard work and understood that intellectually, but actually putting it into practice was a leap beyond what we had expected. I wish I’d known how hard it can be to make time for each other and to remember to put your marriage first, especially after having kids, when you can be so exhausted most of the time! What is one area that my spouse and I could have used better marriage preparation? That one is pretty easy for me. Sitting down and formally laying out who’s responsible for certain things in the marriage. Everything from who pays the bills, how much money each one is allowed to spend without notifying the other one, and who cleans the house, instead of finding out with each fight that something should have been agreed upon ahead of time. My husband and I could have definitely used more preparation with communication! I wish we had known about up and down times and strategies for keeping things harmonious during the down times. We’ve learned along the years, but it would have been nice to not have had to reinvent the wheel. I would have to say that we could have used a purpose or vision statement, so that we could remember to take ourselves out of the equation and focus on our purpose together as a unit. We definitely should have had some counseling about money management to make sure we were on the same page. We were NOT and it took about 21 years of marriage to come to believe the same way. Thank God we got there! My husband and I could have used someone with a realistic take on what marriage really is, to tell us what to expect and what marriage means. I wish now that instead of people saying “you are so young why don’t you wait” and other vague comments and questions; that they would have said how you view life and love right now at this age (21) is going to change. The person (22) that you marry is also going to have a different view on life and love the older you get and the more situations, circumstances and temptations challenge you. It’s important to have individual interest but “mesh” your lives together and remain friends. More importantly keep your relationship sacred, it’s between the two of you and not the two of you and the world. This is what I wish would have been shared in the preparation of my marriage. 13 years later and 2 years separated. Congratulations to Sara who was drawn randomly as the lucky winner of The Marriage Refresher Course Workbook! Congrats Sara – and thank to Dustin for such a nice review of my marriage workbook. Fun to see everyone’s comments and interest in finding different ways to sustain and strengthen their marriages! Engaged Marriage is like sitting in front of a cozy fire for couples committed to prioritizing their marriages. Dustin, your knowledge and down-to-earth style clearly resonates. Keep up the good work! This book is great!It can help a lot for the couple to understand what marriage is all about. Likewise, they were able to strengthen their love, trust and respect to each other. Thank you for letting us know. The Time to Work on Your Marriage is Now! Join our free newsletter to get this popular checklist...plus even more tips to make your marriage thrive.